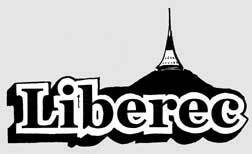 Welcome to Liberec in North-Eastern Bohemia, Czech Republic. 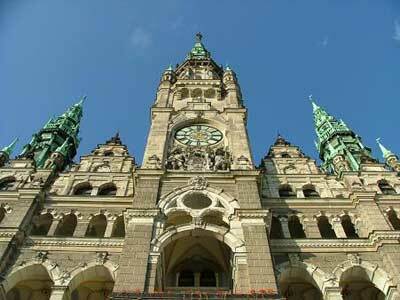 Liberec is the largest city in North Bohemia and has an energetic mix of old and new architecture. Cobbled streets and historic churches pepper the city centre, while the highlights of the suburbs and outskirts are the streets of 19th/early 20th Century villas, the glass and steel reconciliation library and the futuristic hotel and television tower on the peak of nearby Jested. Liberec has around 100,000 inhabitants and has all the cafes, bars, bookshops and urban life you'd expect from a city of the size. It's also surrounded by wonderful open natural areas; the Bohemian Paradise, the Krkonoše national park and the Jizera mountains. 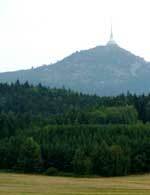 The Ještěd tower is probably the most admired 20th century structure in the Czech lands. Built in the late 60's and early 70's to a design by architect Karel Hubáček, the swooping circular tower takes the shape of its hilltop and curves up to a 94 metre high needlepoint. Inside is a restaurant and cafe with panoramic views in every direction and a stylishly unique hotel with luxury and budget rooms. 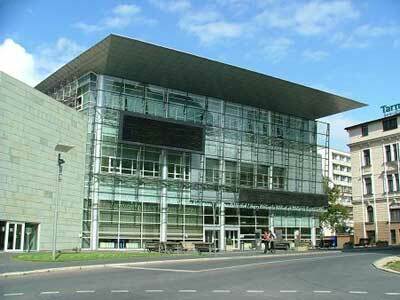 The other really prominent 20th century building in Liberec is the reconciliation library. Two blocks from the main central square, it stands on the site of the synagogue that was destroyed on Kristallnacht in 1938. As the largest and wealthiest city in the Sudetenland, Liberec was a flashpoint for interwar tensions between Germans and Czechs. During the Nazi occupation and under its German name Reichenburg, Liberec became the administrative centre of the Sudetenland and local political leader Konrad Henlein become governor of the entire province. The construction of the library started in 1995 and was a joint project between the Czech and German authorities aimed at healing some of the lingering tension between the two nationalities. The former synagogue is commemorated by a triangular room on the ground floor and the soaring library interior houses over a million books across six floors and is well used by locals and university students both Czech and from abroad. The little cafe just inside the entrance is not bad either. 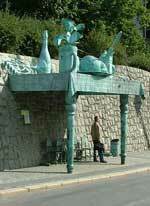 Across from the library is David Černý's sculptural bus stop and around the corner from there the main square is dominated by the town hall, which is a remarkable and imposing neo-renaissance palace built around 1890 to a design by Viennese architect Franz Neumann. 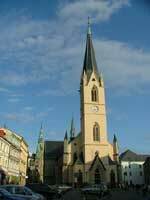 In addition to the council chambers, the town hall hosts the most important of events in Liberec. Weddings, state visits and other ceremonies take place in the town hall and historic figures including emperor Franz Josef, and Václav Havel, and Hitler's henchman Konrad Henlein and Hapsburg have all chosen the balcony overlooking the square as the best place to address the public at crucial moments. The impressive interiors are open to visitors through regular guided tours, but because of events I managed to get into the town hall only on my third visit to Liberec, and even then not to the balcony which was closed for university graduation ceremonies. Being close to the Polish border, Liberec was one of the first places invaded by Warsaw Pact troops in the August 1968 crushing of the so-called 'Prague Spring'. Václav Havel was there at the time and in his book 'Disturbing the Peace' he recounts: “I saw Soviet tanks smash down arcades on the main square and bury several people in the rubble. I saw a tank commander start shooting wildly into the crowd.” The bronze plaque shaped as a tank track on the front facade of the town hall is a memorial to the victims of that invasion. 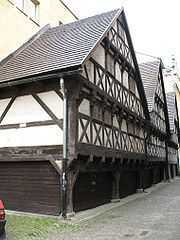 Other historic buildings in the centre of Liberec are the Churches of Saint Antonin and the Sacred Heart and a row of medieval half timbered buildings usually known as the Valdštejn houses. The Valdštejn houses suffered from neglect during the early communist years and only the front rooms have survived. In the 1960s, the rear rooms were demolished and replaced by a brick and concrete structure of three floors that now houses the Liberec School of Building Studies. So, whether you're interested in modern architecture, historic architecture, cafes and nightlife, or a base for exploring the region's mountains, Liberec is the place to stay in North Bohemia.